For someone with little prior experience with horses, the last few years have been a big change for me. Cyndie was much more experienced with horses, but she had never owned one before, nor had she ever been so responsible for their care. We continue to grow increasingly fascinated with horses each passing year. 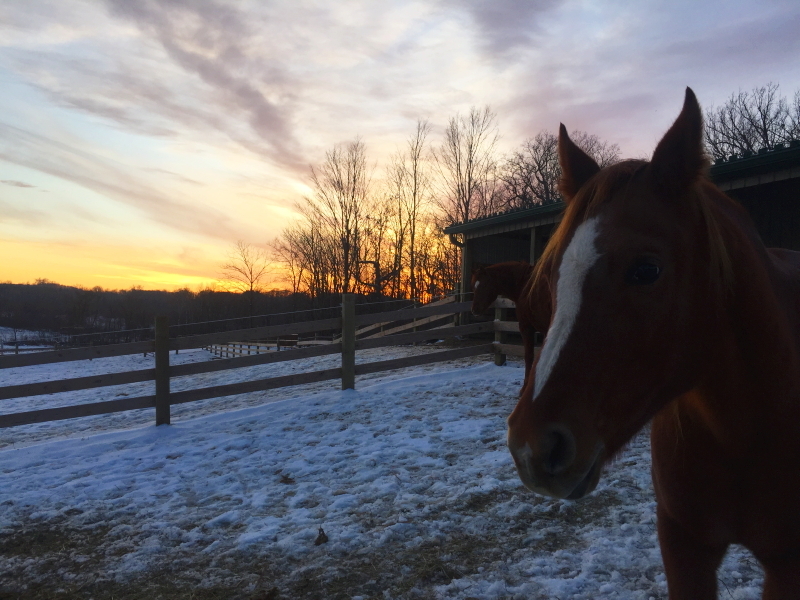 Our horses are an incredible gift. In the time since our horses arrived here, I’ve not felt a strong urge to saddle and ride them. That fact often surprises visitors who are just getting to know us. “Why else would someone have a horse?” many of them seem to think. One of my favorite things is that we are able to allow our horses to spend almost all of their time not wearing a halter around their head. Horses are amazing beings. I am soothed simply by standing in their presence. 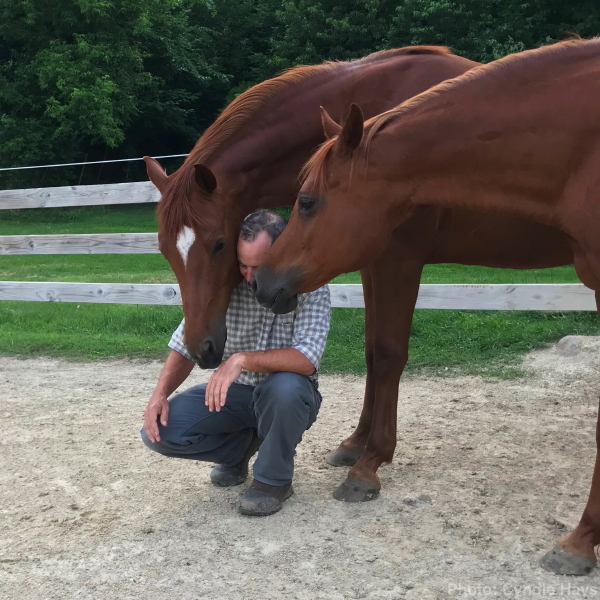 It is quite a luxurious experience to have them residing here with us, where I am able to reach out and touch them, to exchange breath with them, nose to nose. Most days, our horses seem to know me better than I know myself. Some days, they are completely unflappable. Occasionally, they are jittery beyond our reason. They sense things which we fail to detect. I envy how adept horses are at swiftly resolving differences and returning their unconcerned attention to simply grazing. 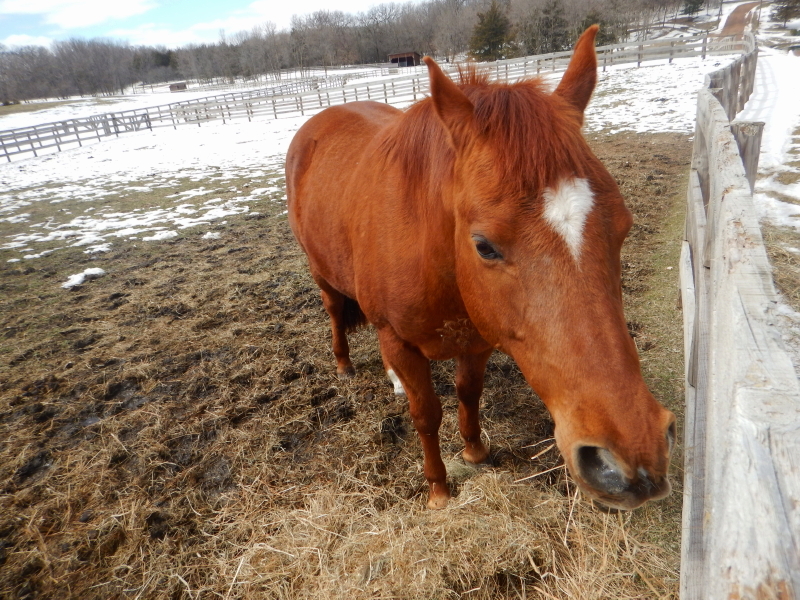 For all the size, power, and speed that horses embody, they are impressively gentle, by their very nature. Put simply, I find them completely fascinating. This weekend, our friends, Mike & Barb, visited for dinner. 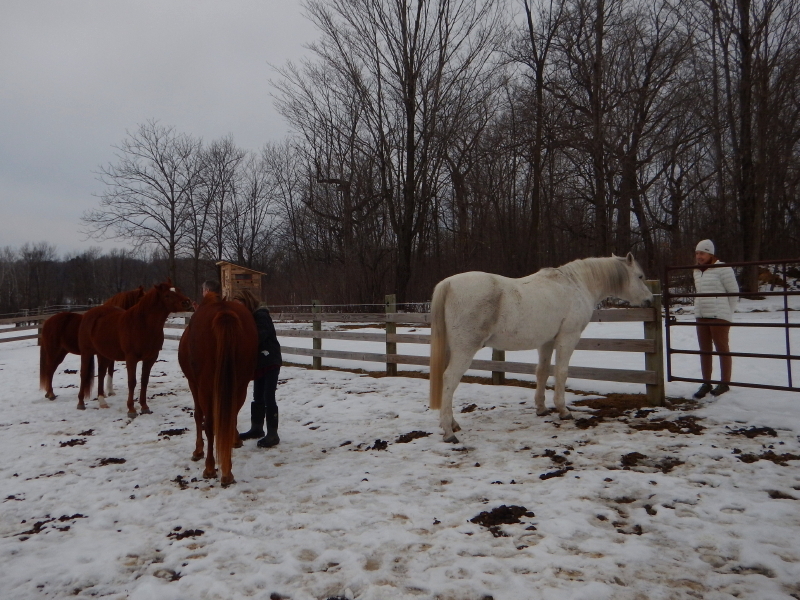 Before sitting down to a sumptuous feast, we took a walk around the property that culminated in a visit with the horses. Mike brought some apples, so I opened a gate to serve up treats from within the paddock. Being unfamiliar with horses, Barb was more comfortable waiting just outside. 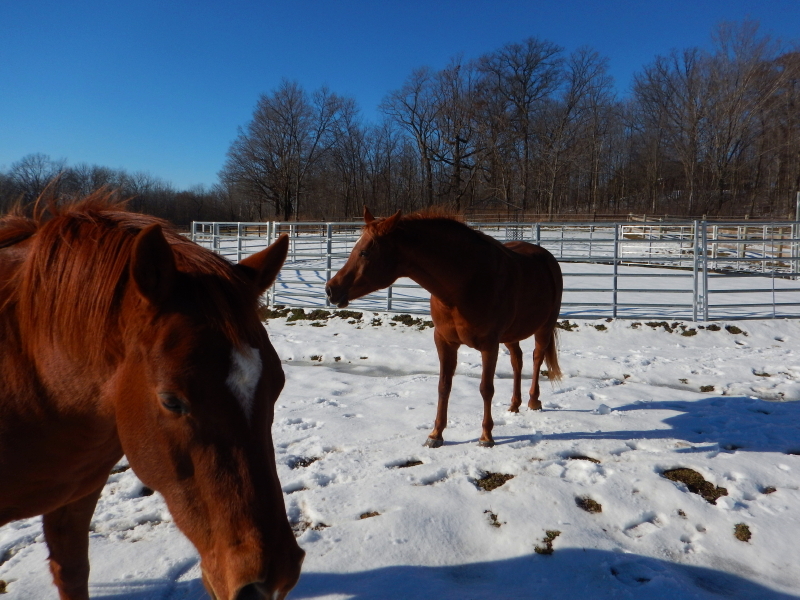 When it comes to treats, the horses are never bashful. 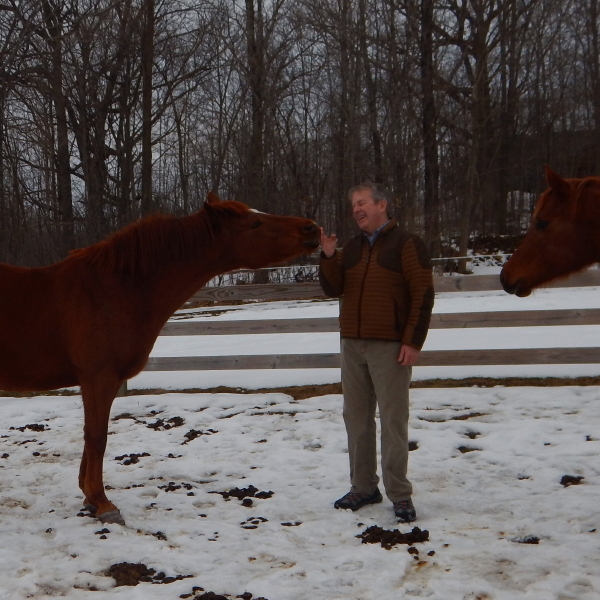 Cyndie, Mike, and I moved among the herd to assure each of the 4 received a fair share. After they’d eaten all the apples, Legacy walked right up to Barb at the gate. I commented that he was probably fond of her color scheme. Especially considering the color pallet that Mike was sporting. Hunter seemed to pick right up on Mike’s playful spirit and soaked up his smell with big yawns and an outstretched tongue. Cyndie pointed out that as herd leader, Legacy’s role is to make sure everyone is safe, connected, and part of the group. 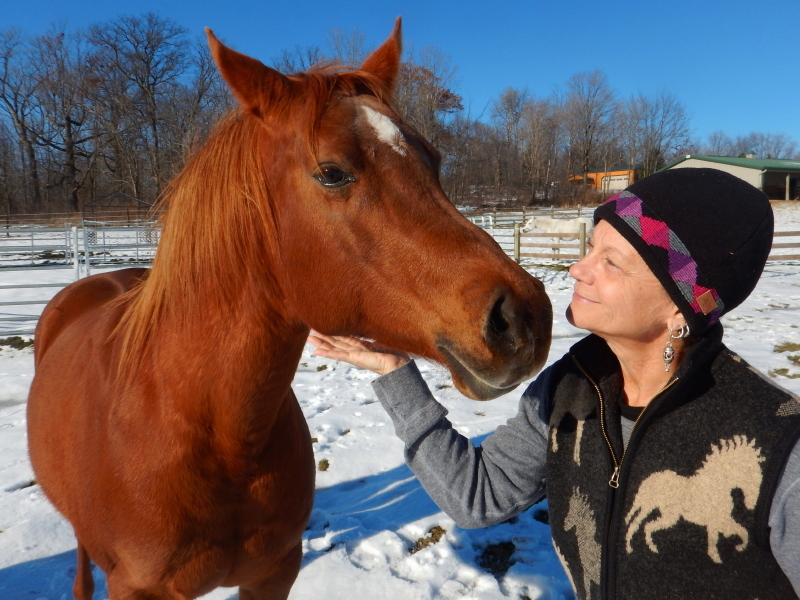 He chose to connect with Barb as a way to include her and acknowledge her reticence and sense of vulnerability over being among such large, and sometimes unpredictable animals. As we discussed this, I was struck by the memory that I was in that very same place of unfamiliarity with horses when we bought this place. I would never think of stepping inside a fence with such large animals. 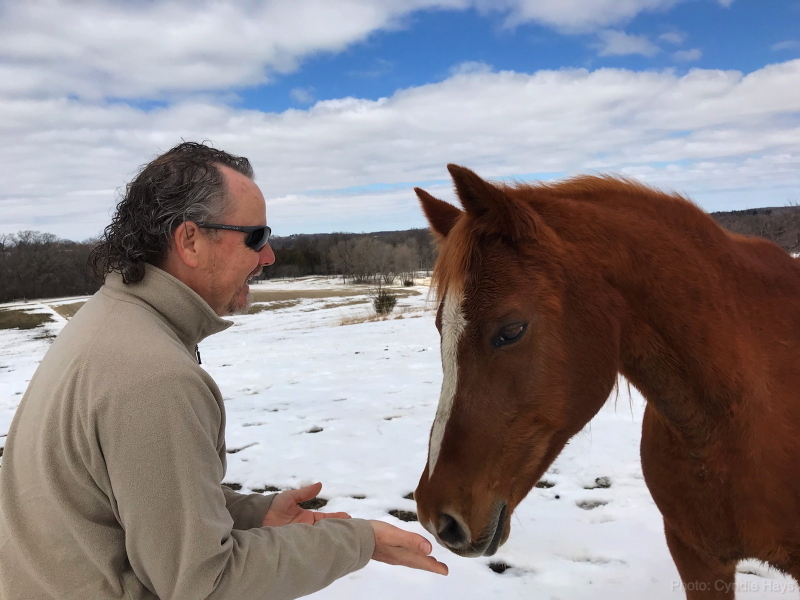 After one weekend of lessons on horse communication, and learning to understand my energies of mind, heart, and gut, I was significantly transformed. 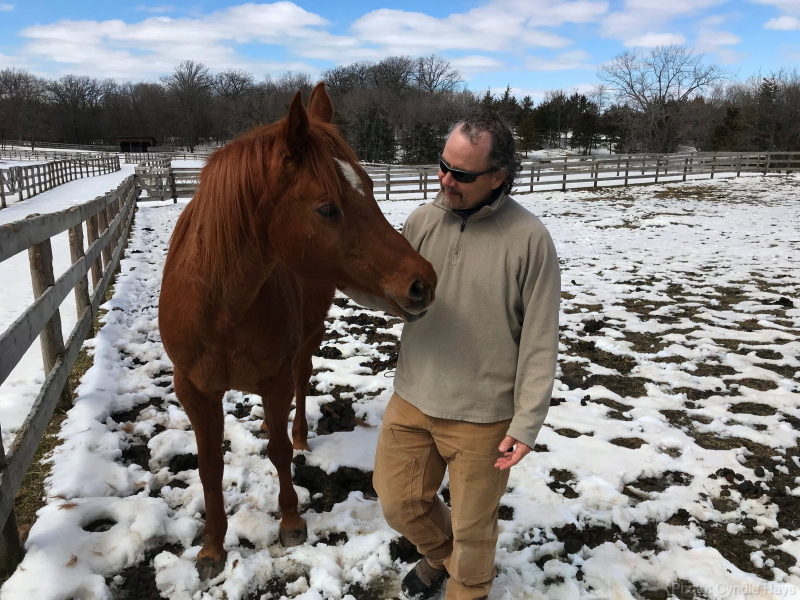 Before the end of the very first day of that weekend, I had moved from being completely naive about anything to do with horses, to finding myself successfully interacting with a horse I had no knowledge of, alone with him within the limited confines of a round pen. It was monumental for me. 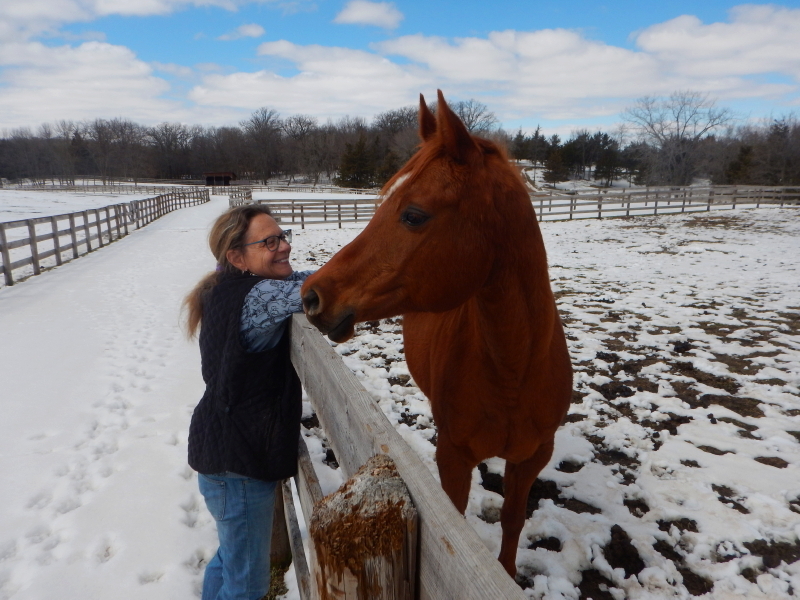 It laid the foundation for everything I’ve learned since, now living as a co-owner of four beautiful Arabian horses. I feel like I’ve come farther than should be possible in such a short time. I also feel like I still know so little. 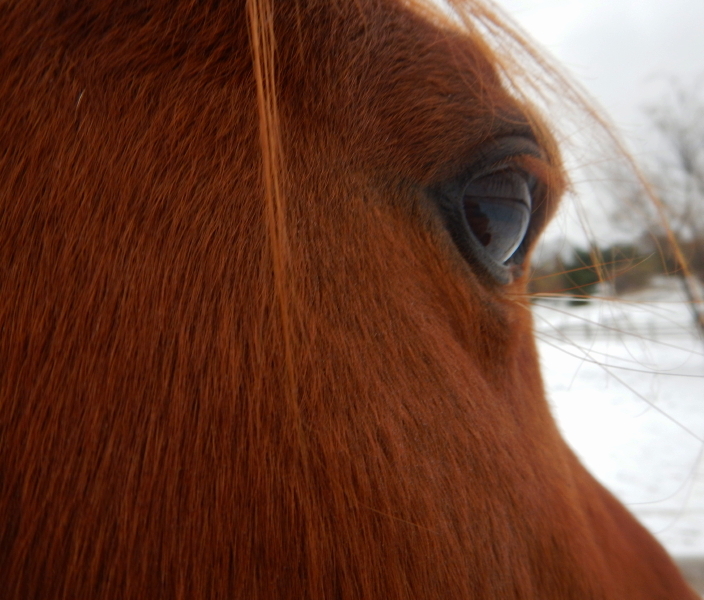 Every day there is more to grasp about the remarkable dynamics of equine perception. More often than not, I get the sense that they know more about me than I do. The weather has been a little cantankerous lately, dishing out some horizontal precipitation in strong winds, with temperatures hovering uncomfortable close to the cold freeze-point. The kind of weather that a horse might not particularly appreciate. I drove home from work on Thursday at a time between showers. The pavement was dry and the overcast sky looked less glum than the rest of the week. When I came over the hill to the first view of our place, there was no one in sight. Over the first rise of our driveway I discovered a distinct absence of horses. Hmm. I whimsically asked myself if maybe Cyndie had sold them. Why would they be inside the barn at this hour? Sometimes the weather at home and the weather at work can be dramatically different, but all indications showed it to be equally dry. It occurred to me that the horses might be making up for the fact we had left them out the night before, when enough windy precipitation showed up that it exceeded their level of tolerance. We had put them in the barn two nights ago, due to a cold rain, but Wednesday evening they were dry and seemed content with things, so I left them out. My sleep was disturbed later that night by the sound of blustery precipitation —I couldn’t tell if it was rain, sleet, or ice balls— hitting the bedroom window. My first thought was of the poor horses out there with their heads down, enduring the insult. I asked Cyndie how they were in the morning and she reported a fairly normal routine and appearance. She said they weren’t necessarily dry, but they weren’t chilled-to-the-bone dripping wet, either. At the same time, Cyndie did have a fascinating report to offer from that afternoon. 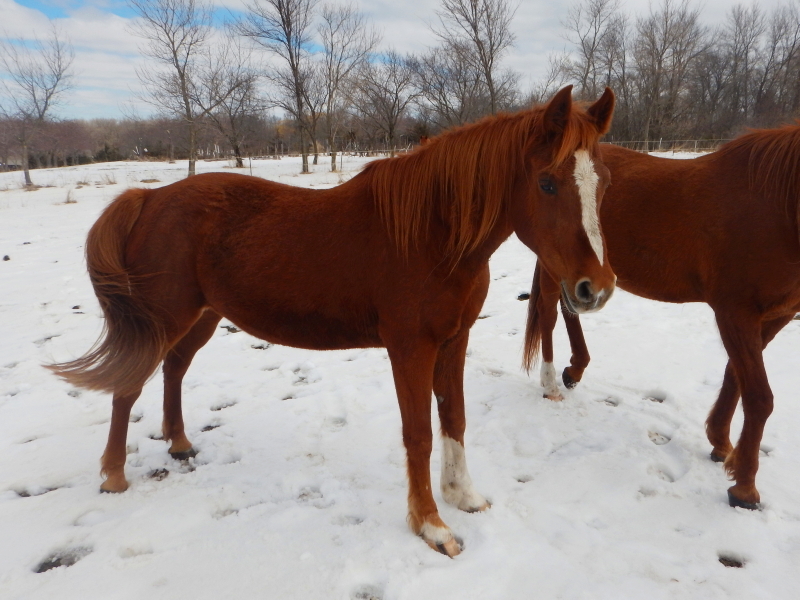 She had left Delilah in the house and wandered down to be with the horses for the specific intent of listening to what they might have to offer. With a lot of concerns on her mind lately, she wanted to stand among the herd with no other cleaning or feeding agenda as distraction. It was early in the afternoon, and like I described, not a bad day outside compared to the rest of the week. The message she got from the horses was insistent and unmistakable. They wanted to go inside their stalls. Now. By the time I arrived home, it looked like nobody lived there. Cyndie was surprised they would ask to be inside so early, but gave them what they wanted. 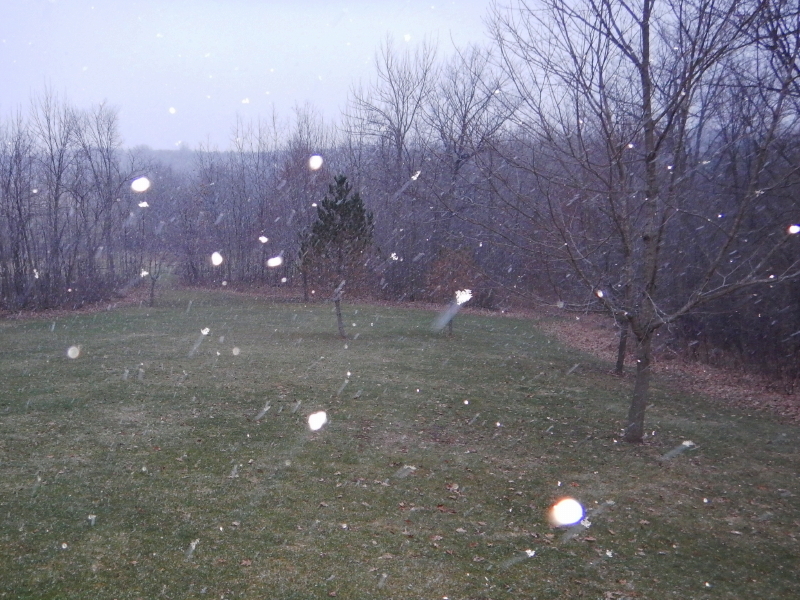 A short time after I got home, the snow started flying. Sloppy, wet flakes that painted the deck with moisture. The kind of precipitation that a horse would probably be tired of enduring this week. The kind of weather a horse would have enough sense to get out of if it had a barn for shelter. All ours had to do was ask. One of the many things I like about our horses is the fact they don’t reflect back to me anything that outrageous politicians say, nor cruelties unleashed by demented terrorists. To stand among the herd in their pasture, there is no sense whatsoever of headline grabbing non-celebrities, no road-raging selfish drivers forcing their anxieties in every direction, no pharmaceutical advertisers listing sickening numbers of possible side effects with encouragement to ask my doctor if their product is right for me. Nothing but eons of evolved horse sense, and all the peace that comes with that.